Coming June, from 25 to 27, Busworld is organising its second new exhibition of 2019. This time Busworld is going to Almaty, the largest city of Kazakhstan. A first reaction might be: “Why Kazakhstan?” But you could not be more wrong about the potential of this raw diamond. 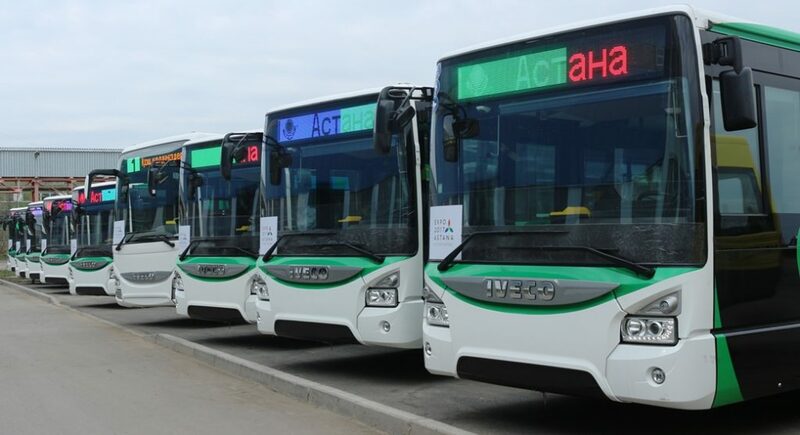 So what is the attraction of Kazakhstan and the potential for bus and coach manufacturers, suppliers and service specialists? Kazakhstan was the last of the Soviet Republics to declare independence during the dissolution of the Soviet Union in 1991. In fact, Russia itself collapsed only ten days after that declaration. Kazakhstan remains closely affiliated with Russia and is a member of the Commonwealth of Independent States. The area of Kazakhstan of 2,700,000sq km is equivalent in size to Western Europe. A small part of Kazakhstan is located west of the Urals and is therefore considered to be in Eastern Europe. The capital is Astana, but the largest city is Almaty. The Government moved to the capital in 1997. Kazakhstan is the largest land-locked country in the world. The current population is around 18.5 million people and 50% of them live in urban areas. Kazakhstan has an interesting mix of ethnic origins. Native Kazakhs account for around 65%, but there is a significant Russian minority of around 25%. The country is the dominant nation in the northern central Asian region economically. It accounts for 60% of the region’s GDP. Kazakhstan has the largest and strongest performing economy in the region. It is estimated that, since 1993, there has been more than $40 billion in foreign investment in Kazakhstan in the oil, natural gas and mineral extraction sectors. The country has substantial reserves of uranium, chromium, lead, zinc, manganese, copper, coal, iron and gold. With its ‘Kazakhstan 2050’ strategy, the country aims to be among the TOP 30 global economies in the world in 30 years’ time. A large-scale project called “New Silk Road” on the territory of Kazakhstan is linking the continents by train. This will transform Kazakhstan into the largest business and transit hub of the region. Literally, it will become the bridge between Europe and China. Kazakhstan is also developing an interregional routes chain. Being in the heart of the Central Asian region, these routes will connect other regions such as Russia, China, Uzbekistan, etc. On top of all the developments mentioned before, Kazakhstan is not only an economically booming country but also an interesting bus market. The cities have invested in new low floor vehicles, coming from Western Europe, China and Korea. A few years ago, Iveco supplied 350 buses fuelled by compressed natural gas to Astana. These were all delivered before the World Expo in Astana in 2017 with the theme “Energy of the Future”. Kazakhstan recently began promoting itself as a tourist destination. Short-term Visa-free entry is available to the citizens of quite a large number of countries. There are regular direct flights to Almaty from quite a number of Western European cities, from Turkey and from a number of Southern and Eastern Asian countries. Tourists are attracted by a wide variety of scenery and activities, with very attractive prices. The development of this new tourist activity will demand a serious level of transport infrastructure provision including new bus routes, new bus and coach services and last but not least: new fleets. There is a limited amount of domestic manufacture of buses and coaches, meaning tremendous opportunities to supply this exciting and growing market.